This past August, Council Member Green, along with the South Gessner Substation police officers celebrated a long awaited event. 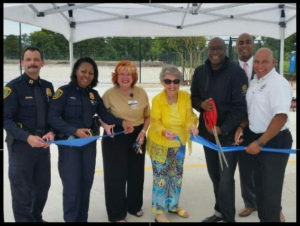 “We are excited to FINALLY celebrate the ribbon cutting of the expanded parking lot of the South Gessner HPD Substation,” states Council Member Green. Nearly 5 years ago, the South Gessner HPD Substation celebrated its grand opening as a new police station for Beat 17, which meanders from the Gulfton area to the greater Brays Oaks community. The facility opened in October 2011 with a total of 134 secured spaces for HPD assets and 9 public parking spaces located at the front of the station. As time progressed, there was indeed a need to expand the available parking spaces for this facility – both for HPD and the general public. In July 2013, the City of Houston purchased 3.3 acres across the street along Westplace Dr. for the purpose of supplementing the needed parking. This expansion project will provide 113 additional parking spaces making a total of 247 secured parking spaces for HPD assets. The expanded lot will augment 29 additional public parking spaces, bringing the total to 38 spaces for the general public. The key participants who played a vital role with this construction project included the Houston Police Dept., Design Team – BRAVE Architecture, General Contractor – P2MG, and the project managers of the General Services Dept.